PortSide New York's headquarters, the Mary A. Whalen is moving to the Brooklyn Navy Yard. The retired tanker, which is being converted for a variety of uses, will be docked at GMD Shipyard in the Brooklyn Navy Yard. 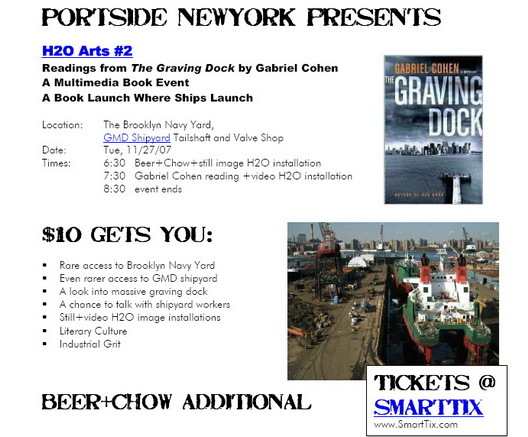 True to form, PortSide--which hosted a Puccini opera aboard the Whalen at the Red Hook Container Port--will be hosting readings of The Graving Dock by author Gabriel Cohen as its inaugural event at the Navy Yard. It's billed as "A Book Launch Where Ships Launch" and "the first cultural event ever at GMD Shipyard." It will take place at the Tailshaft and Valve Shop on November 27 at 6:30.More information is available here at PortSide's website. It's actually the second event in PortSide's H2O Arts Series (Puccini being the first). Graving Dock is Mr. Cohen's third novel. The release for the event says that "In addition to hearing the author Gabriel Cohen read, guests will be able to peer into a massive graving dock, talk to shipyard workers, and enjoy beer and chow during a sound and light show about the harbor. Moving to GMD will enable PortSide to offer more opportunities for people to get to know Brooklyn’s waterfront and maritime history and contemporary activities. PortSide’s home, the retired oil tanker Mary A. Whalen, is a familiar site at GMD. She spent five weeks at GMD this past winter..." Having been there, we can say it's a fascinating place. We're also big fans of Mr. Cohen's work, so who can resist a reading from his new novel in this locale? Bklink: Sign of Change on Bedford Ave.